Two well deserved life memberships were awarded at last night’s AGM to Charlotte Webb and Richard Nevill. Charlotte has also won the SE England Young Volunteer award. Reading ACs U13 and U15 athletes have won the prestigious UK Youth Development League final in Bedford on 8 September 2018 and are now crowned as national champions. The combined boys and girls teams were competing against Blackheath and Bromley, Cardiff Archers, Edinburgh, Marshall Milton Keynes, Preston Harriers and Sale Harriers. Reading's athletes slowly climbed up the leaders table as the day progressed and were trailing the leaders by just three and a half points as the teams went into the final set of relay events. At the end of the relays the Reading athletes, their coaches and family members were ecstatic to learn that Reading had won the competition with a seven and a half point lead. Alton Sports are having a shoe and clothing sale at training on Thursday. Your chance to stock up on winter gear at great prices! Under 11 and under 13 Reading AC athletes were out in number at the Hampshire Grand Prix Open at Basingstoke last Wednesday evening (29 Aug 2018). In favourable conditions many pb’s were set so well done all! Performances of particular note were Kaya Slater running a 13.4 secs personal bestin the 100m and Tomi Adejuwon winning her 70m Hurdles race in a very fast 11.2 secs. Despite hitting the 2nd hurdle, she still lowered her own club record! Reuben Henry-Daire has continued his excellent season with a Gold and Silver medal at the the South of England Champs at Lee Valley on 11 and 12 August 2018. Reuben gained a silver medal in the 200m with a 23.20 time, one tenth outside his own recent club record. He then went on to secure the gold medal in the 300m in a new club record time of 36.29 secs. At the England Championships at a very wet Bedford track on 25 and 26 Aug 2018, Reuben won the bronze medal in the 300m in a time of 36.67 secs. Last minute timetable changes led to Reuben missing out on competing in the 200m final which he had also qualified for. Following the fantastic relays at the Olympic Stadium in July this year, Reading AC relay teams will race at the Club: Connect relays at the Müller Grand Prix / Diamond League event in Birmingham on 18 August 2018. Photos and reports to follow. 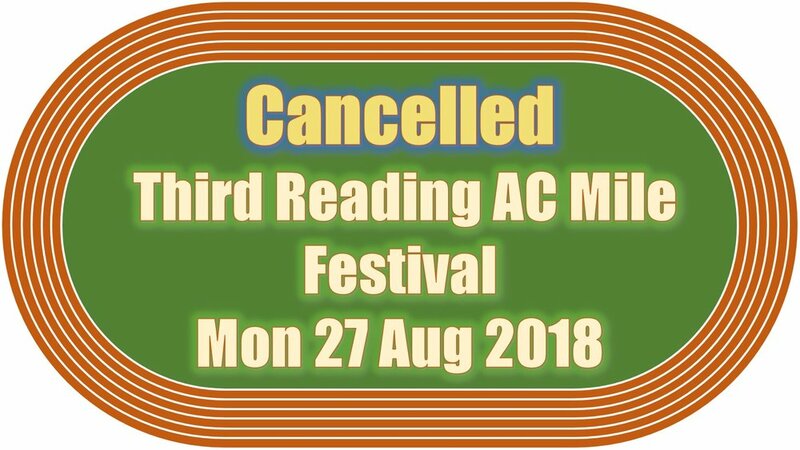 Unfortunately, the 2018 Reading AC Mile Festival planned for Monday 27 August 2018 has been cancelled - for one year only! It will return in 2019. The club apologizes for any disruption caused. A further two club records were set by Reading AC U13 girls competing for Berkshire at the Derek Crookes Southern Inter Counties match at Kingston-upon-Thames on 28 July 2018. Tomi Adejuwon ran a fantastic 70m hurdles in 11.59 secs and all the better as she still has over a year to go in the age group. Mia Greenidge-Knell broke the 2.72 kg shot put record with a put of 10.43m. That particular record had stood since 1996. Tomi and Mia's performances have brought the total number of club records attained this year to forty-three. There will be no training at Palmer Park on Sunday 19 August 2018 as the track and field will be closed.